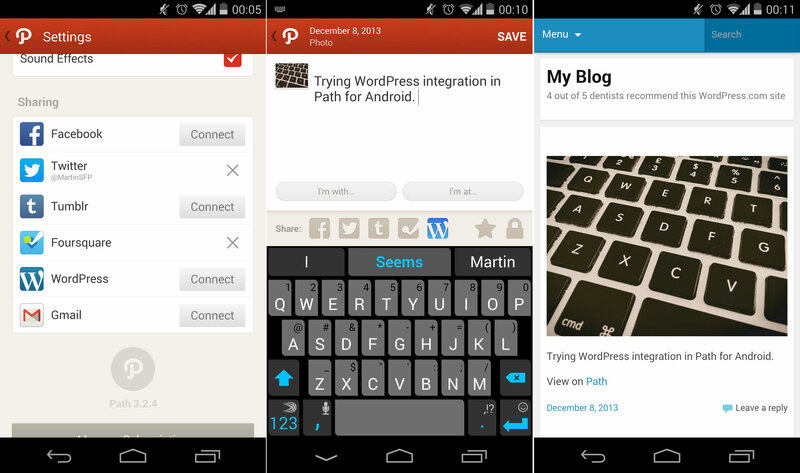 Private social networking app Path is adding a new option to its sharing feature that allows users to post moments directly to WordPress. The Android version has been updated to include this option, but remains missing from its iOS counterpart. No doubt this is likely part of Path’s API partnership with WordPress, which was unveiled in August. Previously, users were able to take their latest blog posts and share them to Path through the use of WordPress’ Publicize feature. This capability also works with the blogging platform’s Jetpack tool. With this update, users can go into Path’s settings menu and connect to their WordPress blog. Then post any type of moment and tap to share it the medium. That’s it — when viewed, it will feature an option to look at it on Path.